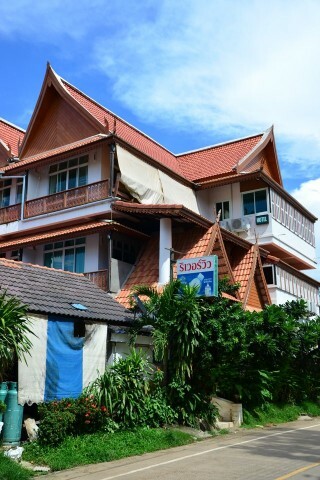 Not to be confused with the Riverfront Hotel, the Riverview is an interesting Thai-style hotel/restaurant located about a half-kilometre further north on a quieter stretch of the riverfront road. The three-storey building’s high-reaching gabled roof with Lao-style eaves makes it look like it could be the monks’ quarters at nearby Wat Si Bung Ruang. A breezy open-air restaurant and lobby with photos of water buffaloes and monks occupies the ground floor. The place seems to cater mostly to Thai and Lao guests; the somewhat disorganised staff speaks minimal English but they’ve always been welcoming to us. If you don’t mind a slightly pokey place to stay, the rooms represent great value for the size and fantastic river views. Reached after a walk up a flight or two of stairs, all of them are spacious and bright, with free WiFi, small TVs, firm beds, mini-fridges, air-con and large hot water wet bathrooms. You’ll probably forget all about the cheap/dated furnishings and scuff marks on the walls when you see the large furnished balconies. The cheaper rooms bag you partial views while the reasonably priced superiors come with lots of space and phenomenal balconies perched very close to the river -- perfect for a lazy afternoon read. While the sign outside posts the name only in Thai script, it does say “hotel” in English and the building is unmistakable.